Hannan sophomore Devrick Burris (24) releases a shot attempt over a Buffalo defender during the second half of Wednesday night’s boys basketball contest in Buffalo, W.Va.
BUFFALO, W.Va. — Whatever ‘it’ was, the Wildcats just couldn’t find it. 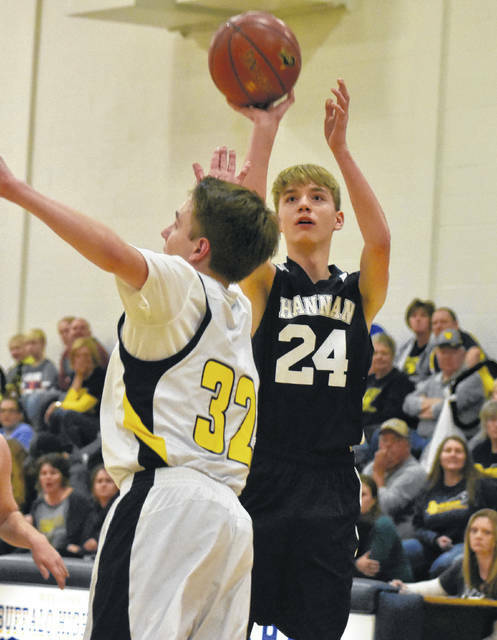 The Hannan boys basketball team struggled to find a spark as host Buffalo led by at least three possessions over the final 25 minutes en route to a 47-36 victory on Wednesday night in a non-conference contest in Putnam County. The visiting Wildcats (1-4) held a brief 3-2 advantage in the opening frame, but the Bison (2-3) answered with nine consecutive points and never looked back. The Blue and White countered with a Malachi Cade trifecta at the 2:08 mark to close back to within five, but Noah Thompson followed with his fourth three-pointer of the canto while sparking a 5-2 run over the final 1:42 — giving BHS a 16-8 advantage through eight minutes of play. The Wildcats were never closer the rest of the way as Buffalo reeled off six straight points as part of an 8-2 run over the opening four minutes of the second frame, allowing the Blue and Gold to secure their largest lead of the night at 26-10. Hannan, however, closed the half on a 7-2 surge to enter the locker room facing a 28-17 deficit. The Bison started the second half with five straight points to increase their lead back out to 15 points just 90 seconds in, but the guests answered with 9-5 run to close the quarter out — giving Buffalo a 37-26 edge headed into the finale. Logan Nibert capped a small 8-6 run over the opening 3:35 of the fourth with a pair of free throws that made it 43-34, but the guests were never closer down the stretch. The hosts ended regulation with 4-2 run over the final 4:11 to wrap up the 11-point outcome. The Wildcats were outrebounded by a 33-28 overall margin, but claimed a 10-6 edge on the offensive glass. HHS also committed one less turnover (14) than the Bison’s final tally of 15 miscues. 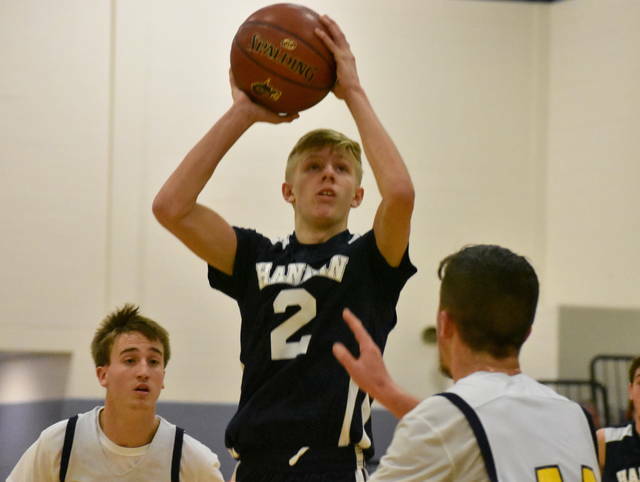 Hannan made 13-of-52 field goal attempts for 25 percent, including a 4-of-21 effort from three-point range for 19 percent. The guests were also 6-of-10 at the free throw line for 60 percent. Dalton Coleman led HHS with 10 points, followed by Nibert with eight points and Matthew Qualls with seven markers. Both Nibert and Qualls also grabbed a team-best six rebounds apiece. Cade was next with six points and Devrick Burris completed the scoring with five markers. Justis Powers-Cupp also hauled in five boards. Buffalo netted 19-of-49 shot attempts for 39 percent, including a 4-of-14 effort from behind the arc for 29 percent. The hosts were also 5-of-10 at the charity stripe for 50 percent. Thompson and Alec Hanshaw both paced BHS with a game-high 16 points apiece, while Ty Parkins chipped in five points and Tyler Morlachetta added four points and game-high 12 rebounds. Stephen Booth, Jackson England and Austin Hinkle rounded out the winning tally with two markers each. Hannan returns to action Monday when it travels to Covenant Christian for a 7:30 p.m. contest.